← R-E-S-P-E-C-T, A little respect is all I need. Just a little bit! The Doctor has been out for a few days. One of the pipes in his sump pump got clogged and a bunch of the old electrical wiring had to be reconfigured. It’s working real well now. It didn’t require any new parts and the insurance will pay for it all. While he was out he left his office window open just like in the old days. 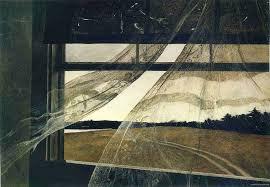 Open Window, Wind from the Sea, Wyeth(1947). The Doctor was not home but his H. sapien sweetheart was asleep in the bedroom. “I flew in very quietly,” said Harriett. Female H. sapien is a sound sleeper. “Peck, peck, click, peck, peck, click, click, space. Click, peck, space, peck, back-pack.” peck….. The Doctor’s keyboard sounded louder than usual. “Someone is looking at me,” sensed Harriett. Harriet rotated her head towards the office door. Sure enough, the big blond canine, that seems to have less sense than the black one, was staring at her. His eyes reflected the blue-white light of the monitor. And true to form the big blond canine shhh’ed. Harriett provocatively, risked making a scene. ” You’re not the brightest bulb, are you?” She taunted. Marley climbed back on the living room sofa, where he was not allowed, silently.